Is online advertising really important to our industry? Have you been given the sales pitch to advertise on sites such as British Medical Journal (BMJ) by your media agency? In our latest guide to digital we look at online advertising and hopefully give you a few tips before you start advertising online. Online advertising allows you to reach more users in a shorter period. Everything is tracked, with some providers letting you see statistics in real-time, if not the next day, allowing you to be reactive to the advert. You are able to build awareness in an engaging way. You can reach your targeted audience whilst they are on the move. Advertising online allows you to directly to where your users are. Providing the right message (content) appropriate to you target audience. When you are doing your planning cycle, research where your users are. Ask for data about the various sites from your media buyers or try the UK online measurement company. Target your message towards each site, ie don't just have the same banner message across multiple sites – try different copy and creative. Don't retrofit your press advert online; look for ways how you can enhance your message and create interaction with your advert. For example see the online advertisement for Pfizer's real danger campaign. And make sure your advert is compliant with the Advertising Standards Authority and the ABPI Code. Once you've created your campaign, this is then sent to the media-buying agency, which then in-turn sends the advert to the publisher. They will use a platform such as Double Click, Adtech or Flashtalking to display your advert. Then after your advert is live, it's up to you to make sure you track it daily and see what works and what doesn't on each individual site. Finally, spend a small chuck of your budget testing what works, and then launch the best working campaign. 88 x 31 pixels - Micro bar. In addition, 110 pixels wide x 80 pixels is the size of an advert on Facebook. Tenancy is usually a sponsorship of the site or certain sections, where the advertiser pays a flat fee for a certain period. CPM (cost per mille) or CPT (cost per thousand impressions) is a flat fee for a thousand page impressions, some mobile advertising is charged at cost per each impression. CPC (cost per click) or PPC (pay per click) has become popular because of Google, where an advertiser only pays when a user clicks on the advert. CPA (cost per action or cost per acquisition) is a popular form of advertising for e-commerce sites as the advertiser only pays when a user clicks on the advert and then goes on to buys a product. CPE (cost per engagement) is relatively new to the ad industry – here an advertiser only pays when a user engages (usually by rolling their mouse over advert) for around 3 seconds or more. CPW (click-to-mobile web) click launches the web browser. CPVC (click-to-call) click initiates an outgoing call to the content provider or advertiser. CPV (click-to-video) click initiates an advertiser's video commercial for a product or service. CPS (click-to-SMS) click initiates an SMS for a user to send a keyword to a short code to request more information. The click-through rate (CTR) is typically quite low for banner advertising. For example average click-throughs are 0.3 per cent which means that 3 in every 1,000 people who view a banner advert will click on it. CPC models work best for disease awareness campaigns, as although you're paying for the click-through, impressions for the campaign remain free. This helps with brand awareness, and is usually best applied to sites like Facebook and Google where you get 10 times more impressions than click-throughs. Of course, this all still depends on your, copy, creative and timing, as with any campaign. Faisal Ahmed is head of digital at Life Healthcare Communications. Ahmed was previously part of the start-up team at Amazon, and was later responsible for digital strategies at 90 football clubs, the England and Wales Cricket Board and the World Rally Championship. He was also previously head of digital at Langland, winning over 30 awards for his digital work. 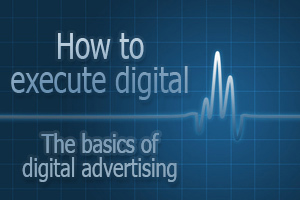 Get stuck into digital - the right way!